If you’re keen to see the progress being made on the first public areas that will open later this year, head to the Goodwill Bridge where you will enjoy the best vantage points of construction underway. 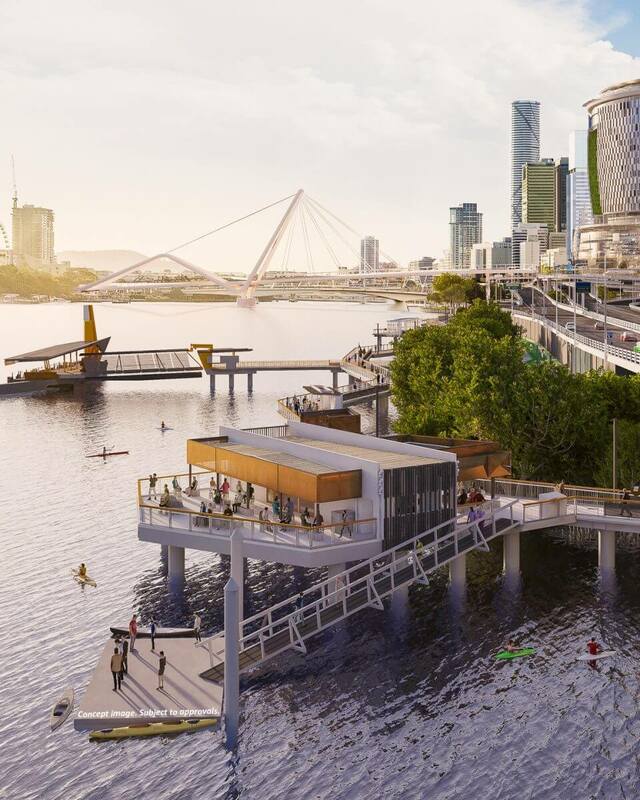 Locals and visitors will find a stunning transformation taking place along the riverfront to build new recreational areas, Mangrove Walk and Waterline Park; and will see activity underway to upgrade the first 500 metre stretch of the Bicentennial Bikeway, from the Goodwill Bridge to 1 William Street. With marine piling works now complete, 15-metre-long precast concrete deck units will be installed sequentially upstream and welded securely to the existing piles to help form Mangrove Walk, a 450 metre above-water pedestrian walkway along the riverfront that will stretch from the Goodwill Bridge to 1 William Street. Despite January being a short work month, appointed contractor Multiplex and subcontractor Waterways, made fast work of the concrete platform for the walkway’s Boathouse Pavilion. When fully complete, the Boathouse Pavilion – accessed from the Mangrove Walk– will become a place where people will be able to purchase light refreshments while taking in the stunning riverfront views. Meanwhile, construction on the future Waterline Park is transitioning from in-ground services to above-ground works with lush garden beds and pathways now being installed. In the near future, Waterline Park will provide a subtropical recreational place for people to enjoy with seating, bike racks, gym equipment, and table tennis tables included. To stay informed about our construction activities, subscribe to our construction notices by clicking on the ‘Stay Informed’ button on our website www.queenswharfbrisbane.com.au or follow us on our Queen’s Wharf Brisbane Facebook page www.Facebook.com/queenswharfbrisbane.